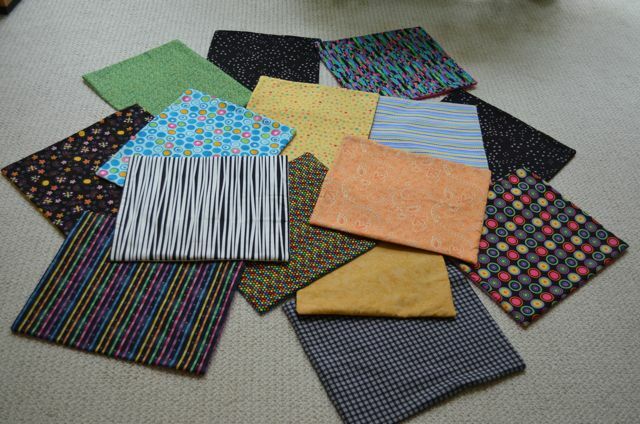 Explorations in Quilting and Life: Cats, cats, cats! Right before I left on my last trip, I received a call from our local humane society from someone about making some cat quilts from some donated fabric. Each cat receives a quilt for their bed from they are brought in to the facility and the quilt goes home with them when they are adopted. It is a really simple project - basically cutting fabric, adding batting, and sewing everything together yields what the Humane Society wanted. So, of course I said yes. I am half way through the fabric and the results are a wide ranging assortment of colorful little rectangular quilts. Great project, Judy -- but knowing cats, will any of them actually use them? Oh yeah; wait. These are for the cages in which the cats live till they're adopted, by which time they're used to the bed and it will go with them to their new homes. :-) Wonderful! Yes, each cat has their own quilt in their cage. Hopefully, it provides some sort of security blanket....and makes their temporary living quarters more comfortable.